Crouching Tiger, Hidden Dragon is a martial arts film that is so much more than the sum of its action sequences. The setting is 19th century China, and renowned swordsman Li Mu Bai (Chow Yun-Fat) has entrusted his fabled sword, the Green Destiny, to the care of his old friend, Shu Lien (Michelle Yeoh). Shu Lien is the leader of a security force, and has promised to deliver the Green Destiny on Li Mu Bai’s behalf to another friend, Sir Te (Sihung Lung). Arriving at Sir Te’s compound in Peking at the same time as Shu Lien are Governor Yu (Fa Zeng Li) and his family. Governor Yu’s daughter, Jen Yu (Zhang Ziyi), is about to marry a man she has never met, yet secretly the young girl yearns for a life of adventure. That first night, the Green Destiny is stolen by a masked intruder. Upon his arrival in Peking, Li Mu Bai is informed of the theft, and believes the culprit to be none other than Jade Fox (Pei-Pei Cheng), the woman responsible for the murder of his master years earlier. Li Mu Bai sets out to retrieve his sword and avenge his master’s death, but Jade Fox has a few surprises of her own waiting for him when he arrives. A beautiful motion picture with many exquisitely shot scenes, Crouching Tiger, Hidden Dragon also dedicates a large portion of its running time to the exploits of several strong female characters, including the film's chief villain, Jade Fox. As Li Mu Bai’s nemesis, Jade Fox personifies evil, and yet, despite her nasty temperament, we come to understand her motivations. When Li Mu Bai confronts Jade Fox and accuses her openly of murdering his master, Jade Fox, who has since become a martial arts expert, remains defiant, shouting back at him, “he deserved to die, and at the hands of a woman! I was good enough to sleep with, but not good enough to train!” In spite of her murderous ways, Jade Fox assumes the role of a 19th century woman's rights advocate, an oppressed individual who longed for more, and took what no one would give her. Martial arts movies have certainly come a long way since the exciting, mindless fun of the '70s, evolving into a genre that challenges the mind and excites the senses. Crouching Tiger, Hidden Dragon brought this change to the forefront. The movie explores inner conflicts, deep-flowing emotions, love, and desire, and does so in a manner that's as exhilarating as its finest fight sequence. 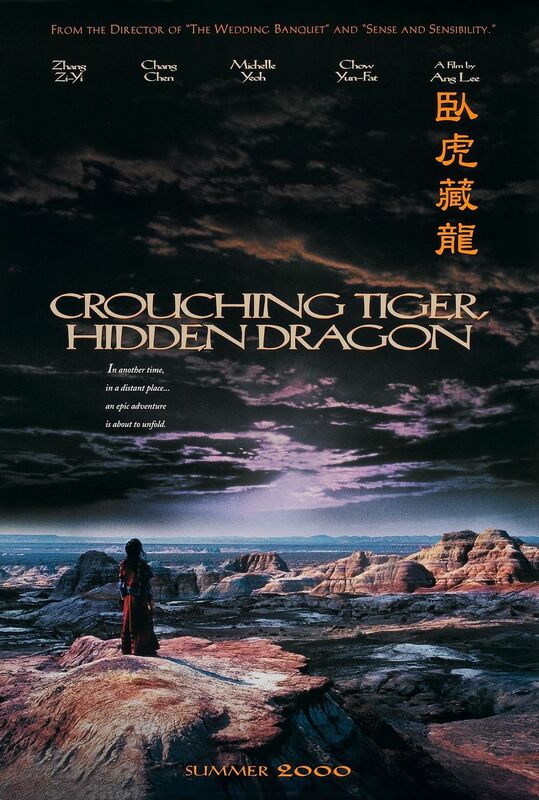 Crouching Tiger, Hidden Dragon is groundbreaking cinema. This is an amazing film and definitely one of my ten best of all time. Its epic sequences, lush landscape photography and visceral imagery are excellent. Wrapped it up in an heartfelt tale of loe, woe and regret, and wow -- truly amazing. Such a great film. The action scenes were wonderful.